I’ve read a few threads where customers have installed the WYZE Cam outdoors and thought I would add my version. My single daughter wanted an inexpensive way to monitor the goings-on outside her duplex. 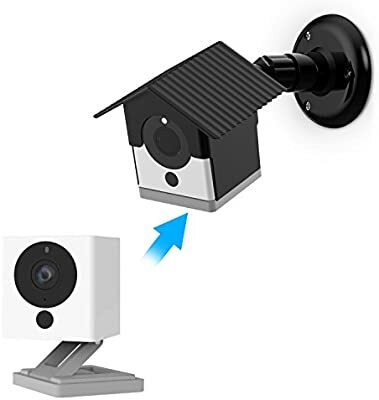 She already owned one WYZE Cam so I purchased her another for outdoor surveillance. I knew I wanted to use an sealed transparent box that I could mount above her garage door so I purchased the Uxcell 4.53"x3.54"x2.16"(115mmx90mmx55mm) ABS Junction Box Electric Project Enclosure Clear from Amazon. Small and unobtrusive the box was just large enough for the WYZE Cam, it came with a weatherseal strip and box screws. I only had to supply the deck screws to mount it above the garage door. I drilled a hole through the back of the box and through the garage wall. For a power source I ran an extension cable from where the garage door opener plugs into. She owns a Netgear R7000 router which has more than enough WiFi power and range to reach the WYZE Cam outside. It’s been up and running for a week and she’s quite happy with the results. Great idea! If you didn’t, you may want to putty or caulk the hole closed to avoid condensation from a temperature differential. If you want to go nuts you could seal the hole and toss a desiccant pack in the bottom of your enclosure also. Great job! I'm assuming the night vision doesn't work through the plastic lid, right? Do you think it will overheat in the summer? I think if it were me, with the overhang available in the location, I would have just mounted as high up under the overhang as I could get it and not worry about it getting wet. Then the night vision would work and heat would be less of a concern in the summer. Thanks! I’ll have my daughter monitor for any moisture condensation and if it becomes a problem I’ll try your suggestion and seal the hole in the back of the box. How’s it work in the Night mode? The FAQs say these won’t work at night through glass. The camera box faces east and being under the overhang generally doesn’t get much wind driven rain or snow…but it is something I’ll have my daughter monitor. The box itself has a decent weatherstrip that runs around the edge perimeter. If rain started sneaking around the backside of the box my first inclination would be to use some clear silicone caulking where the box meets the garage wall exterior. 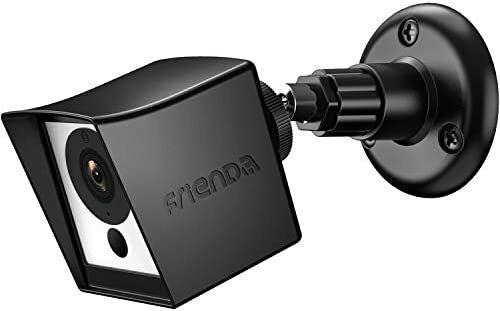 The night vision does work but in my daughter’s case it gets blurred by the motion detection outdoor light that comes on whenever someone or something comes within range. So for night vision it’s not the best scenario. She could turn off her outdoor light but she’s not sure she wants to do that. As mentioned in my previous post it does work but the night vision feature is compromised by the motion sensing outdoor light fixture. And it’s not glass but a plastic enclosure. There’s a white one available too. Where do you find this $12.99 actual case? Copy and paste the last bit of my post into your browser. Amazon had them I believe. I installed 5 V2 outside, 3 of them using the <$1 metal plates from home depot. The 1st pair I use a 5V/2A power supply, not the Wzye 5V/1A one, then 10 feet cable to the 1st camera, then daisy chained to the 2nd camera, in the picture, with a 15 feet cable. It is not that secure but so far so good. The Wyze mount looks cute and may work for some but I still think I prefer something that provides better weather protection. I read some of the negative reviews on Amazon and that is one of the complaints. I’m not saying my mod is a better solution just more fitting for my daughter’s location. Can the box I mounted be ripped down by a vandal? Yep. However the Wyze mount looks even easier to tear down. Your neighborhood may not have these issues. "I prefer something that provides better weather protection." I agree. I like the OP's version better. That cheap plastic Amazon box probably wouldn't last past one winter. Plus it is almost begging to be messed with by vandals. Did you have to change the power supply to a 5V/2A power supply, not the Wzye 5V/1A one? I thought you could daisy chain two together which is why there is a USB port in each? I’m just asking if you tried it. Thanks. Both Amazon mounting brackets mentioned in the thread seem inviting until you start to read some of the reviews. It seemed they started selling these shortly after I came up with my makeshift solution. What I find interesting (although it’s normal photography practice) is that the USB cable is never shown attached. They like to show a ‘clean’ install with no dangling wires. With a solid swivel it’s obvious there is no way to route the USB cable internally. If these brackets are mounted on a second story level they are out of harm’s way but if they are on the first floor or ranch style home they are easier to vandalize. My 2 cents. I just received the Frienda iSmart case that I ordered. There is a place in the back for the cord to be fed through. It is somewhat of a flimsy silicone design. By no means is it completely sealed from outside humidity, and would not slow someone down from stealing the camera. Since mine is mounted way up under my eve, I am considering just mounting the cam itself without a case. If someone were to decide to go with the Frienda iSmart case, I would recommend choosing the black one instead of the white. At night, the IR reflects off of the white casing around the front and causes a cloudy blur to the picture. One amazon reviewer stated they colored over the white part with a black expo marker and reported that it helped a lot with the cloudy blur effect. He posted helpful pictures to describe the difference in the picture.
. We will see what happens in the winter.